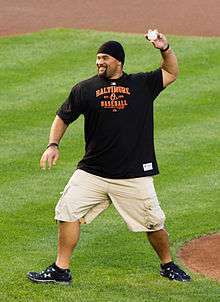 Ngata throws the first pitch at a Baltimore Orioles game in August, 2012. Ngata was listed as a five-star recruit and the No. 2 overall prospect in the nation by Rivals.com. He chose Oregon over BYU, Nebraska, Texas A&M, and Washington. Ngata also played rugby in high school, and helped lead the Highland Rugby Club to the National Rugby Championship. He was red carded in the championship match. A devout member of the Church of Jesus Christ of Latter-Day Saints, Ngata said he felt most at home at Brigham Young University, but struggled to make his college decision. He eventually signed a national letter of intent to play for the Oregon Ducks football team of the University of Oregon. Ngata tore his anterior cruciate ligament (ACL) on a punt coverage play in 2003 and missed the rest of that season. But over the next two seasons, Ngata became one of the best players in college football. Ngata totaled 107 tackles, 17.5 tackles for a loss, and 6.5 sacks total in the 2004 and 2005 seasons. He was a second-team All-Pac-10 selection in 2004, a first-team All-Pac-10 selection in 2005. Following his senior season in 2005, he was recognized as the Pac-10 Defensive Player of the Year and a consensus first-team All-American, Oregon's first in 43 years. Ngata also earned praise as a dangerous special teams player, blocking 7 kicks during his 3-year career at Oregon. He had a 495 lb (225 kg) bench press max, which ranks second all-time among Oregon Ducks football players, behind only Igor Olshansky's 505 lb (229 kg). Ngata decided to leave Oregon a year early because his mother, 'Ofa, was in the early stages of kidney dialysis. She died from her illness on January 13, 2006. Ngata was selected by the Baltimore Ravens in the first round (12th overall) in the 2006 NFL Draft. It was the first time in franchise history the Ravens used a first round pick on a defensive lineman. Ngata became the highest selected defensive lineman from the current Pac-12 conference since Andre Carter in 2001. On July 28, 2006, Ngata ended a brief contract holdout by agreeing to a 5-year contract worth up to $14 million with the Baltimore Ravens. In his rookie season, he started in all 16 games and finished the campaign with 31 tackles, one sack and an interception. The following season, he made 63 tackles and three sacks. Ngata had two interceptions in 2008. Ngata (far left), Ray Lewis, and Terrell Suggs chase down Pittsburgh Steelers running back Willie Parker in 2006. In the 2008 season, Ngata started all 16 regular season and three postseason games. He led the Ravens defensive line with 77 total tackles (43 Solo, 34 Assist), one sack, a career-high 2 Interceptions, and 5 passes deflected as part of the NFL's #2 passing defense. He was named to the Pro Bowl as a first alternate and earned Second-Team All-Pro honors by the Associated Press for the first time in his career. During the 2009 season, Ngata started all 16 Ravens regular season and both post-season games. During the regular season, he recorded 36 tackles, of which 26 were unassisted and 1.5 sacks. He was selected for the first time in his career to play in the NFL Pro Bowl. After an outstanding 2010 season which included 63 tackles and 5.5 sacks, Ngata was selected to the 2010 All-Fundamentals Team by USA Football and the NFL Players Association. On February 15, the Ravens placed their franchise tag on Ngata. On September 20, he was signed to a 5-year deal worth $61 million. The Ravens opened the 2011 season at home against the Pittsburgh Steelers on September 11. In the game Ngata forced a fumble and tipped a pass that led to a Ray Lewis interception; the Ravens won 35-7. Two weeks later against the St. Louis Rams, Ray Lewis sacked Sam Bradford. Bradford fumbled, and the ball was recovered by Ngata who scored his first career regular season touchdown. On October 2, 2011, during the Ravens game against the New York Jets, Ngata sacked Jets quarterback Mark Sanchez, causing Sanchez to fumble the ball. Ravens linebacker Jarrett Johnson picked up the fumble and returned it for a touchdown. The Ravens won the game 34-17. After reviewing the hit, the NFL levied a $15,000 fine against Ngata for roughing the passer even though no penalty was called by officials during the game. Ngata finished the season with a career-high 64 tackles (36 unassisted), along with 5 sacks, 2 forced fumbles, and 5 passes defended. Ngata also earned his third straight Pro Bowl appearance. Ngata is known throughout the NFL for being a very versatile player. He mainly lines up at strongside defensive end in the Baltimore Ravens 3-4 base defense, but sometimes lines up at nose tackle. In their 4-2 nickel package, he lines up at defensive tackle. This versatility makes Ngata one of the most dominant defensive linemen in the NFL. In 2013, Ngata played mostly as a nose tackle making 33 tackles, 1.5 sacks, and 3 passes defended in 15 games played. On August 29, 2014, Ngata was fined $8,268 for intentionally kicking Washington Redskins guard Shawn Lauvao during the final preseason game. On December 4, 2014, Ngata was suspended for four games after he violated the NFL’s policy on performance-enhancing substances. On March 10, 2015, Ngata was traded to the Detroit Lions to play defensive tackle.Ngata struggled in the first half of the season with an injury, but gained momentum and finished with 2.5 sacks and 24 tackles. On March 9, 2016, the Detroit Lions re-signed Ngata to a two-year, $12 million contract, with $6 million guaranteed. Ngata was born in Inglewood, California, to Solomone Ngata and 'Ofa (née Moala), who had emigrated from Tonga to the United States in the early 1970s. He has two older brothers, Solomone Jr. and Finau, a younger brother, Vili, and a younger sister, Ame. Haloti Ngata was named after his maternal uncle, Haloti Moala-Liava'a, who was a middle linebacker for the Utah Utes (1984–1988). The family moved to Salt Lake City, Utah, in 1990. In December 2002, Ngata's father died in a single-vehicle truck accident, while trying to climb the on-ramp to Interstate 80 from Route 215 just outside Salt Lake City. His mother, having battled with Chronic Kidney Disease/Diabetic Nephropathy for years, died in January 2006. Ngata's extended family includes numerous athletes. One of his cousins, Tevita Moala, was a starting linebacker on Oregon State's 2000 Fiesta Bowl team. Another cousin, Fili Moala, was an All-American defensive lineman at Southern California (2004–2008), and previously played for the Indianapolis Colts. Ngata is also a distant relative of basketball player Jabari Parker. Ngata resides in Finksburg, Maryland with his wife Christina Ngata (née Adams) whom he married in June 2007. The couple has three sons, Solomon (born July 2009)—named after his late grandfather—, Haloti Maximus (born August 2012) and Colt (born January 2014). ↑ Lisiate Wolfgramm, "Gentle Giant", Planet-Tonga.com, undated. ↑ Feldman, Bruce (2002-05-28). "A recruiting pitch of another kind". ESPN.com. ↑ "Haloti Ngata". Nfl.com. 1984-01-21. Retrieved 2010-09-20. ↑ "DT Haloti Ngata franchised by Ravens". espn.com. 2011-02-15. Retrieved 2011-02-11. ↑ "Ravens sign Haloti Ngata". espn.com. 2011-09-20. Retrieved 2011-09-20. ↑ "Ravens force 7 turnovers, crush Steelers 35-7". WJLA-TV (Washington). 2011-09-11. Retrieved 2011-10-08. ↑ Ravens: Ngata scores a touchdown, Carroll County Times Retrieved 13 August 2012. ↑ "Haloti Ngata fined for hit on Mark Sanchez". Baltimore Sun. 2011-10-07. Retrieved 2011-10-08. ↑ Wesseling, Chris. "Lions acquire Haloti Ngata in trade with Ravens.". NFL.com. Retrieved 10 March 2015. ↑ Birkett, Dave (March 9, 2016). "Detroit Lions re-sign DT Haloti Ngata on 2-year deal". Detroit Free Press. Retrieved March 9, 2016. ↑ "Haloti Ngata Stats". ESPN. ESPN Internet Ventures. Retrieved 10 March 2015. 1 2 Bellamy, Ron (February 10, 2002). "Ducks make emotional, religious connection with top recruit". The Register-Guard. 1 2 Chadiha, Jeffri (May 8, 2006). "Bittersweet: Haloti Ngata's draft joy came in knowing how proud his parents would have been". Sports Illustrated. 1 2 3 4 5 "Sense of loss drives Ravens' Haloti Ngata". Baltimore Sun. ↑ "University of Oregon Fiesta Bowl team, lightning rod of controversy, defies stereotypes 10 years later". The Oregonian. September 29, 2010. ↑ Morrissey, Rick (2012-01-28). "Simeon's Jabari Parker is more than just a basketball star". Chicago Sun-Times. Retrieved 2012-01-31. ↑ "'Perfect kid' Ngata grows into brick wall". Carroll County Times. January 1, 2010. ↑ "Ravens' Ngata still keeping on the weight". ESPN.com. August 6, 2012. ↑ "Ravens Pro-Bowler Haloti Ngata ponders his football mortality after another season of injuries". Baltimore Sun. January 10, 2013. Wikimedia Commons has media related to Haloti Ngata.